ashen cheekbones and cobalt lips. you, him, my sweet young friend. never wanted to grow up without you. the loving biting thorn bushes. a flower die from loneliness and a mother make love to her son among raspberries. of Buddhist incense and hurricane salt. crouched low on my knees). milk of my soul, lashing. 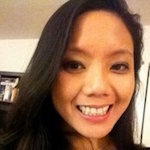 INGRID CHUNG is a tenth year teacher at the Urban Assembly School for Applied Math & Science in the South Bronx, where she currently teaches a 12th grade Honors English course & serves as an assistant principal. She is a 2007 Teaching Fellow and is particularly passionate about effective new teacher training and development programs as well as transformative intervention systems for at-risk students. Ingrid holds a B.A. in English and creative writing from New York University, a M.Ed. in adolescent English education from Hunter College, and a M.A. in educational policy (School Building Leaders) from New York University’s Steinhardt School of Education. Her proudest achievement as an educator has been her development of two leadership programs for boys & girls called Umoja & Nia, which launches in the mountains as a five night summer camp for at-risk youth.